We got ‘In the BUFF’ with painterly portrait photographer, Ben Marcum! 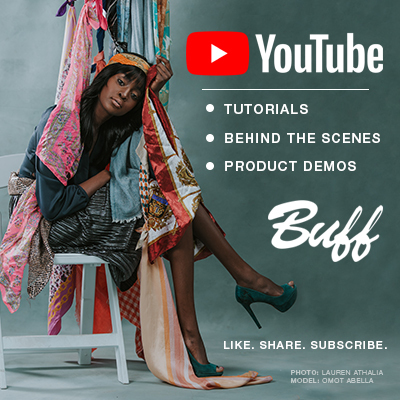 Shedding light on his inspirations, style, and more, Marcum shares with us his influences, creative process, and how he went from hobby to profession with Paul C. Buff, Inc.
What sparked your interest in photography? After my full-time theater career was wrapping up I was beginning to do websites for people. I thought instead of buying stock images and using client’s cell phone headshots, I’d purchase a camera and take care of that in-house. It was downhill from there! Once I discovered the impact a great photo could have on someone, it was clear I wanted to go down that path and leave behind websites. 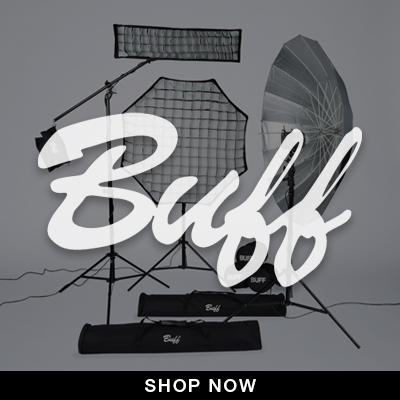 What made you choose Paul C. Buff, Inc. for your studio strobe needs? At first, it was the price. I was starting my business from zero, so did not have tons to invest. I did a lot of reading and talking to other photographers about what they were using. I knew I wanted something that was going to be a rock solid workhorse and be consistent. I started building stock with the B800s and that’s still what I am using, there are 5 in my studio now. When did photography turn into a business for you? Almost as soon as I bought my first DSLR. I was already set up as a business owner. So the websites, photography, and the occasional freelance sound design were how I was keeping the money coming in. My heart and passion really pushed me harder to make the photography side my primary focus, so that got the most energy. These days, I really don’t do much with websites (besides my own) or sound design. (that’s only kind of true, since I just worked on a show this past fall. I don’t think one ever REALLY gets out of the theater, but it’s something I do occasionally for fun, not my career). Do you have a “Go To” lighting setup? For headshots, I either use a triangle set up with (2) 10″ x 36″ Foldable Stripbox and a 24″ x 36″ Foldable Softbox on the bottom, or if I’m using more shadow, it will be (2) 10″ x 36″ Foldable Stripboxes only, plus 2 on the background to take it white. For Portraits, I will often go with one 47″ Foldable Octabox and a white reflector, many times with a large fill right behind me. What’s your creative process leading up to a shoot? I am really drawn to a “painterly” aesthetic in my portraits, drawing a lot of inspiration from classical portrait artists and sculptors. When I’m thinking about creating portraits for someone, I concentrate on their style and personality, and on the sort of vibe that appeals to them, and I figure out how to capture and maximize that, but I also try to visualize how portrait is going to look framed and hanging in their home. What/who influences you and your work? These days, it’s a lot of the old masters – painters like Rembrandt, Vermeer, Van Dyck, John Singer Sargent, László, Winterhalter, DeCamp. I’ve been staring at a lot of statues recently as well. The work of Hiram Powers is just stunning. I like to spend time in museums and love it when a piece of art or sculpture just stops me in my tracks. Is there a photographer, either past or present, that inspires you? That list could go forever…but, Annie Leibovitz, Mark Seliger, Sue Bryce, Platon, Joyce Tenneson, Richard Avedon, Irving Penn, Peter Hurley, and a host of friends who push me. What would be your dream photoshoot? What a question! I don’t think it is any celebrity or anything like that (though photographing Dave Grohl would be kind of awesome.) So I think instead of “Who would it be?”, it’s more like “ how will it be?”. And for me, that’s when someone just lets me go, says “I trust you. Make your art.” That’s my dream photoshoot and I am really lucky that I get to do that a fair amount, actually. Do you have a favorite photograph you’ve taken so far in your career? I don’t think I have a favorite. There are images I really like and make me really proud when I see them. I’ve got several printed and framed in the studio. It is a really cool feeling to walk in every morning and see them. What advice would you give a photographer that is just starting out with off-camera flash? Slow down and look at your light. A flash is nothing more than a little sun that you can move. Start with one strobe and a reflector, then build. Study. Play. Mess up. Study More. Once you learn how light works, the sky is the limit. I want to bring my style of portraiture into more homes. I think cell phone photos and social media and casual snapshots are great, but I feel like the “classic portrait” is ready for a resurgence. Portraits used to be special art that people displayed and cherished, something that evoked an emotional response every day. A portrait would spark conversation and stories, it would be passed down through the family, it was a legacy. I want to bring that back. Louisville photographer, Ben Marcum, launched his photography business in 2012, specializing initially in headshot photography, a natural fit for someone who had previously spent 20 years in the performing arts. Perhaps most importantly, Ben loves his work and has a real affinity for photography, making his clients feel comfortable enough to share their personality while being carefully directed to capture their best features. Ben’s lifetime in the arts, comfort behind the camera and easy rapport with his clients provided a natural transition from headshots into classic portraiture, and he is now pleased to offer stunning personal portraits and family portraits.